Anyone who knows me will tell you, “Amber doesn’t eat veggies.” It’s kind of a joke because until about 12 years ago, I really didn’t eat veggies. I only ate all the bad one – potatoes and corn. As a baby, my mother says I used to love vegetables. As I got older, I started listening to my sister complain about vegetables and I stopped eating them. So what changed? I’m adult now and I know that I need to eat vegetables. It doesn’t mean I love them but at least I started trying them to figure out what I liked and how I liked it. Let me start by saying, I still don’t eat canned veggies. They are nasty. But fresh is hip and I can actually afford to buy it so I do. What I learned? I like raw spinach and romaine lettuce. I still won’t eat iceberg lettuce and you will never catch me ordering a salad as my entire meal at a restaurant. But I will sample a salad at a luncheon or fundraising dinner now. I like asparagus and will eat it as a side dish at a restaurant. I’ll eat onions and peppers if chopped finally in a dish. I like to cook with tomatoes. I like raw celery if it is the crunch in a recipe. Zucchini isn’t bad with hummus. The one vegetable I don’t love raw or cooked is broccoli. I just can’t get past the smell – I don’t care how much cheese you cover it in. 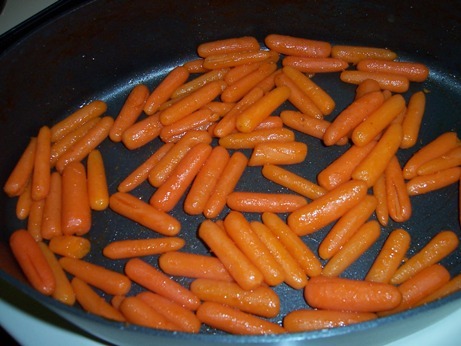 As for carrots, I learned I liked them cooked. Whether it was in with a roast or in a soup, I would eat them. When I ran across this recipe for carrots in a Kraft magazine and it had 5 Stars, I decided I had to try it. Yes, I know carrots are better for you if you eat them raw. But if a little sauce gets me to eat my vegetables, it’s better than not eating them at all. I hope this recipe helps your kids eat their veggies. I also think this would make a great side for your Easter ham. I halved the recipe and just used one bag of baby carrots. I don’t like nuts so I made this recipe without them. Still good. I used Fat Free Dressing and light syrup. It still works and cuts the amount of fat I’m adding to my vegetables. Here is a simple breafast dish sure to please all. I got this recipe from my mother but I’m not sure of the original origins of this recipe. Although the original recipe has pecans, I don’t like nuts so I make it without. It delicious both ways. In two glass custard cups, evenly split the butter, corn syrup, and nuts. Melt in the microwave for 1 to 1 1/2 minutes on high. Meanwhile, mix remaining ingredients in a small bowl. Once butter is melted, spoon even amounts of Biquick mix into custard dished. Microwave for another 1 to 1 1/2 minutes (until no longer doughy). Remove from microwave and cover with a plate and invert. Careful remove custard cup, spooning excess caramel onto dish. Let cool slightly before serving so you don’t burn your tongue. I have seen a lot of recipes for cheesy hash brown potatoes – even baked a few. But my mom’s recipe is still the best. I’ll never forgot the time my Grandma Fletcher tried to modify this recipe. My Grandpa Fletcher doesn’t eat chicken or turkey. He grew up on a farm with chickens…and you get the idea. My grandfather had enjoyed this recipe when mom brought it to a family gathering. My grandma asked for the recipe because she also enjoyed it. Grandma thought my grandpa wouldn’t eat it again if he knew it had cream of chicken soup so she swapped it out for cream of mushroom. She also didn’t have any corn flakes so she decided to top it with Frosted Flakes. (I’m laughing just writing this.) Anyway, she bake the casserole and tried to serve it to my cousins Becky, Dan, and Marilyn when she was babysitting them one-time. Needless to say, no one would eat it after just one bite. The lesson, you can’t always modify recipe with what you want or have in your pantry. I think this dish makes an excellent side dish for a baked ham. Perhaps you can cook this dish for your Easter dinner. Combine all ingredients in baking dish. Bake for 1 hour at 350 degrees. I use a Tupperware That-A-Bowl to mix this. I also let my hash browns sit out for about 30 minutes because it is easier to mix them. Don’t use fat free sour cream and cream soup. It won’t set up properly if you do. You can us light sour cream , healthy request soup, and skim milk though. You can top this with corn flakes if you want a crunch. I saw this recipe in the current issue of Self magazine. I have to admit, I hadn’t really read their magazine until I got a free subscription with my registration for the 2011 Susan G. Komen Kansas City Race for the Cure. This is a great magazine filled with all sorts of lower calorie recipes and tips to help you live a healthier lifestyle. Check them out or get your own free subscription when you register for our 2012 Race. I wanted to share this recipe because so many people who completed the Girl Scout cookie poll selected Samoa (or Caramel Delight) cookies as their favorite. 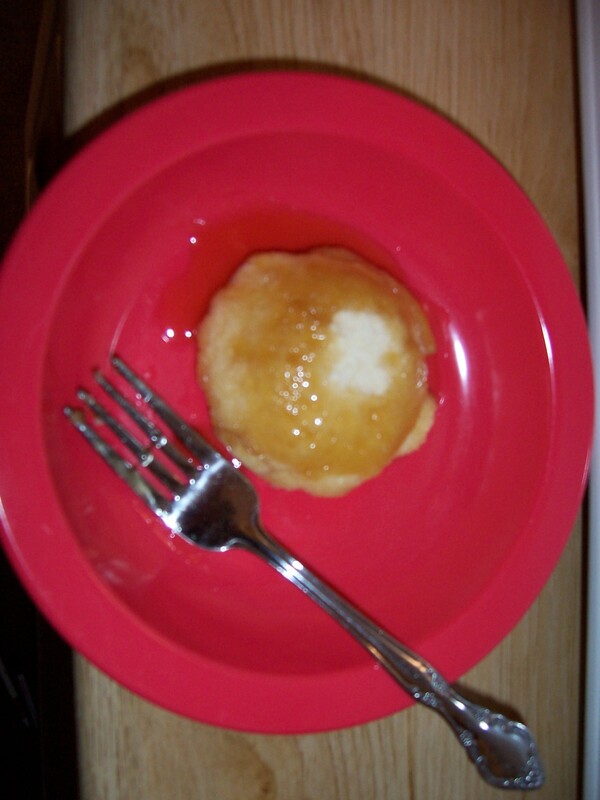 This lower fat/calorie dessert is sure to be a hit those also watching what they are consuming. Pre-heat oven to 300 degrees. Toast coconut for 15-20 minutes until golden, rotating ever 5 minutes. Let cool. Cover baking pan with Parchment paper and place wafers on top. Microwave caramel and milk on High for 2 to 3 minutes, stirring frequently until smooth. 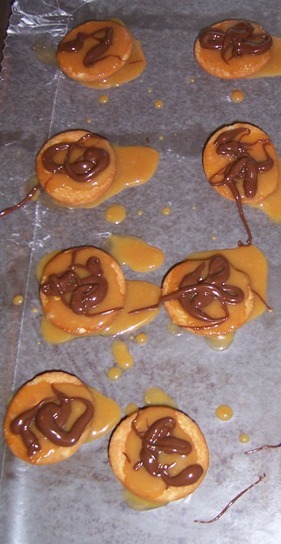 Fold coconut into caramel mixture. Spoon a 1 T. onto each wafer and let cookies cool for approximately 5 minutes. Microwave chocolate chips for 1 to 2 minutes, stirring every 30 seconds. 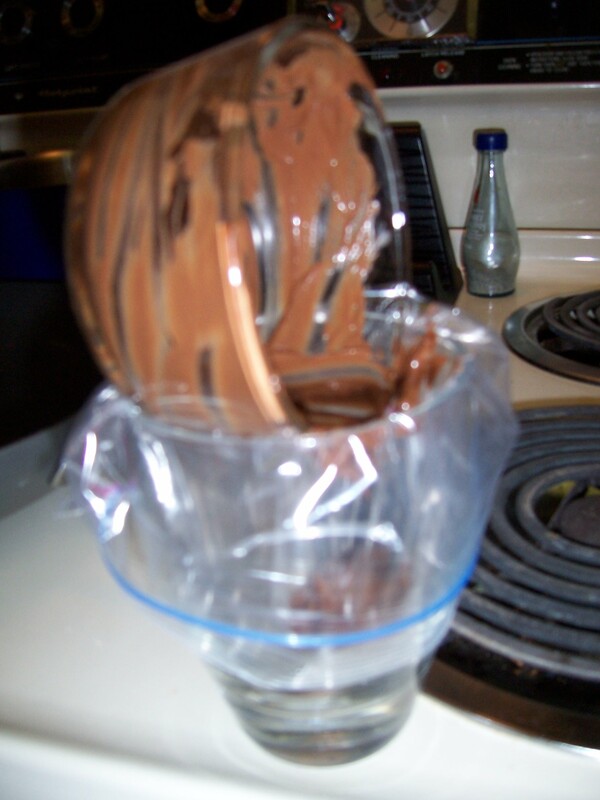 Pour chocolate into a baggie, snip the corner, and drizzle over cookies. Cool before eating. Yields 24 Cookies. Nutrition Facts per Cookie: 52 calories, 2g fat, 1g saturated fat, 8g carbs, 0g fiber, 1g protein. A friend check this on her Weight Watcher app and each cookie is one point. I don’t like coconut so I made this without it. My co-workers still enjoyed it. Quick trick I learned from Social Suppers to reduce mess in the kitchen. Place a baggie in a glass cup pulling over sides. Fill with chocolate. Pull from glass and zip baggie. I got this recipe from an old co-worker and friend at Hope House. I think Gretchen made this once for a wedding shower and I loved it. She told me how easy it was to make and shared the recipe. I hope you enjoy it as well. Pre-heat the oven to 350 degrees. Spray an 8×8 glass dish with cooking spray. Spread crescent along the bottom to make a crust. Place in the over for 8 minutes to partially cook. In the meantime, cook and drain sausage. Add gravy to cooked sausage and stir. Spread gravy mixture on top of crescent roll crust. Top with desired amount of Mozzarella cheese. Bake another 20 minutes. Remove from oven and cool slightly before cutting. A few weeks ago, I woke up really early for work and I couldn’t get back to sleep. Since my gym wasn’t open, I decided to make myself useful and cook up a new recipe. I got this recipe in my August/September 2011 issue of Simple & Delicious magazine. You know sometimes when you don’t know what to order at IHOP you order one of those everything platters, this is perfect for that craving. It combines eggs, hash browns, and biscuits & gravy into one dish. Nothing is overpowering so you will love it. Brown sausage. Then, add flour, salt, and 1/4 tsp of pepper until blended; gradually add 3/4 c. milk. Bring to a boil; cook and stir for 2 minutes or until thick. Remove from heat and set aside. In another skillet, cook butter and potatoes until tender. Whisk eggs, garlic salt, and remaining pepper and milk; add to skillet. Cook and stir until almost set. 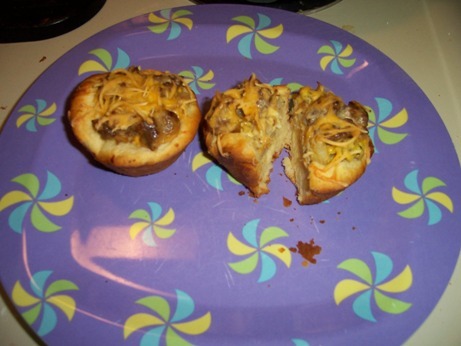 In a sprayed muffin tin, place biscuits and push up the sides. 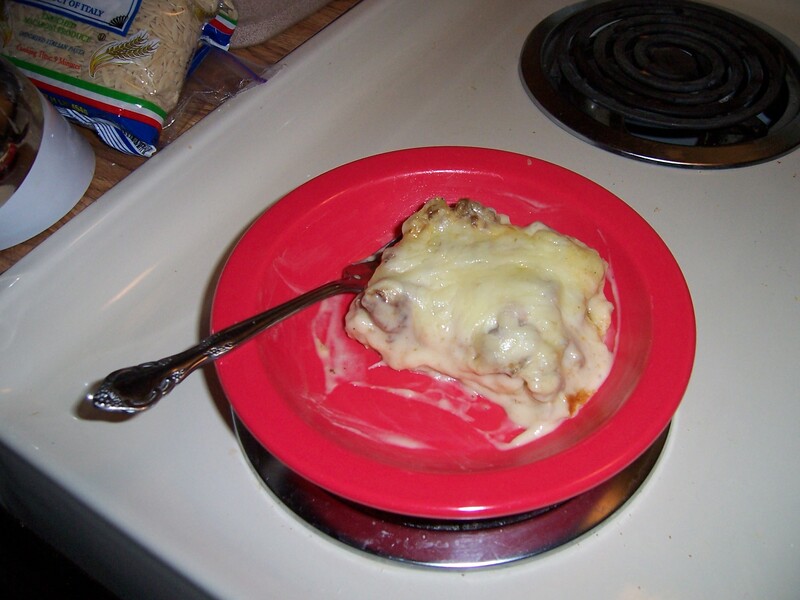 Spoon egg mixture, half the cheese, and sausage mixture into cups; sprinkle with remaining cheese. Bake at 375 degrees for 18-22 minutes or until golden brown. Cool for 5 minutes before removing from pan. I substituted the small biscuit can (10 regular size muffins). I also substituted cheddar cheese for Colby-Monterey Jack cheese. I used 1/4 lb. of reduced fat Jimmy Dean sausage, fat free cheddar cheese, and skim milk to save a few calories. I think this would be a good recipe for a brunch. This week is Americorps Week so I wanted to share a recipe for a dish that makes me think of of my AmeriCorps days. Good lasagna is divine. I love to eat Valentino’s lasagna when I go home to Nebraska. It’s makes me think of my AmeriCorps days. Valentino’s has this great to-go lunch. You can get about 15 different combinations of pizza, pasta dishes, salads, and breadsticks. They always had a line but it moved very quickly. 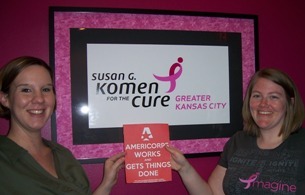 The location on the corner of 17th & South was super close to our AmeriCorps office and my home. On Fridays, we always had our AmeriCorps staff meeting from Noon-3PM. It was the one time our entire staff was together in the office so we could plan our after school, summer, or community outreach activities. Then, we would head over to our after school program. It was also a very long day for me. I usually headed straight to my hotel job after finishing Kids Club. That meant I wouldn’t get home until 11:30PM. We didn’t take meal breaks at that hotel so I often wouldn’t be able to eat dinner til I got home from work. Valentino’s single serve lasagna and dessert breadstick was probably my favorite meal on the to-go menu. I think part of the reason was because I didn’t get hungry during my second job. I also liked eating at Valentino’s because of personal connections to the restaurant. One of my fellow AmeriCorps member’s father-in-law was a part owner of the restaurant chain. I also remember my cousin Jeanna getting her first job in high school at Valentino’s. She would work for another Valentino’s location during her college days. Although I enjoy a good piece of lasagna, I have never really loved any of the homemade recipes I prepared myself until I found this one. It isn’t your traditional lasagna as it doesn’t have any layered noodles. I first discovered this recipe through a friend’s Facebook recipe sharing group. I shared this recipe with my friend and co-worker Denise (a fellow AmeriCorps Alum pictured w/ me above) who is vegetarian. She and her husband substituted veggie meat and added mushrooms. They also loved this lasagna with a twist dish. Brown beef and onions til cooked. Drain and add spaghetti sauce, tomato paste, and seasoning. Pour into 13 x 9 baking dish. In a separate bowl, combine ricotta and mozzerella cheeses with parsley. Open can of crescent rolls and make four rectangles. Spread with cheese mix. Roll jelly roll style and cut each into four pieces. Place on spaghetti mix. Sprinkle dish with Parmesan cheese. Bake at 350 degrees for 30-40 minutes. My original hometown of Wisner, NE is a Irish community. That meant you had to wear green on St. Patrick’s Day or someone would pinch you. 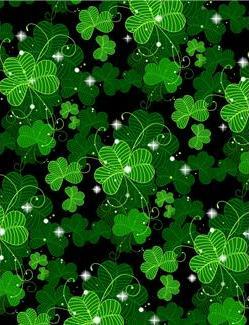 As a kid, I remember school letting out early on St. Patrick’s Day so you could go participate in the festivities. If it wasn’t raining, the city would paint a big Shamrock on Main Street. I believe the parade started at the City Auditorium and featured the high school marching band. We usually watched it from the curb at my dad’s service station. But my sister’s senior year, she was on the float as a candidate for Shamrock Princess. For dinner, we would sometimes get pizza with a green crust or a green twist ice cream cone. I’m pretty sure lots of people drank green beer but I wasn’t old enough to hang out at the bars to find that out for sure. I was surprised at just how many recipes I have seen lately for St. Patrick’s Day. Sure, you expect to see recipes for Irish Soda Bread, Sheppard’s Pie, and Corned Beef and Cabbage. Today’s recipe is fun snack from the Betty Crocker website. But I think you could enjoy it anytime of year. In a large microwavable bowl, mix cereals, pretzels, and peanuts. In a glass bowl, mix brown sugar, butter and corn syrup. Microwave for 2 minutes, stirring after each minute. Stir in baking soda until it is dissolved. Pour over cereal mixture and stir until evenly coated. Microwave on high for 1 to 2 minutes, stirring every 30 seconds. Spread out on wax paper to cool. After 5 minutes, sprinkle with M&Ms. Break into bite-sized servings and place in gold foil muffin baking cups. Store leftovers in an airtight container. Makes 20 servings (1/2 c. each). My aunt Kathy and her family are die hard Irish fanatics. Not only do they enjoy eating at Browne’s Irish Marketplace and watching The Elders, but they are also very involved in Irish events. A few of Kathy’s siblings have chaired Irish Fest and Kansas City’s St. Patty’s Day Parade. A few years ago, my aunt event started a St. Patrick’s Day parade in her hometown – Troy, KS. In this small town of 994 people, the parade takes about 15 minutes from start to finish. My aunt usually carries an Irish flag while my uncle Kermit drives their vehicle with Kermit the Frog riding shotgun. But my family’s philanthropic commitment comes through as they ask attendees to bring canned goods to the parade to support their local charity. I found this Irish inspired recipe in a recent Taste of Home email. It gaves me a chance to use my Keurig so I thought I would give it a try. I liked and I hope you will enjoy it. In a blender, combine the ingredients and process. Store in refrigerator. 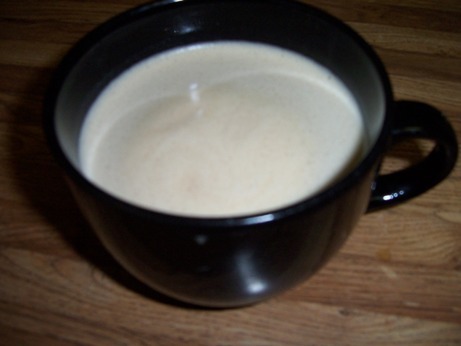 When ready to serve, mix 1/3 c. Irish Cream mix with 1/2 c. brewed coffee. Heat mixture in microwave if desired. Entire recipe makes enough for 10 servings. Nutrition facts (per serving): 165 calories, 11 g. of fat (7 g. saturated fat), 53 mg sodium, 12 g. carbs, and 3 g. protein. The editor’s noted you can add Irish whiskey. I used skim milk. I think you could also use a sugar substitute and it would still taste good. Last year, I went to Harvester’s Forks and Corks fundraiser. If you have never been, I would totally recommend going. It’s a food lovers delight! Some of Kansas City’s best restaurants and libations come together to provide sampling of their foods/beverages. And the best part is all the money raised from ticket sales and auction purchases benefits our community food network. While attending Forks and Corks, I sampled a delicious pulled pork slider with coleslaw. I can’t remember what restaurant it came from but it was great. Shortly after, I saw this recipe in my Kraft Food and Family magazine. I finally got around to making it. Although it was as good as I anticipated it tasting, it was alright. I little the bite-sized sandwich for portion control purposes. Check it out and see what you think. Cook chicken and barbecue sauce in a covered saucepan on medium-low heat for 10 minutes or until heated through, stirring frequently. In a separate bowl, mix slaw and dressing. Fill rolls with chicken mixture and top with slaw. Makes 12 sandwiches. 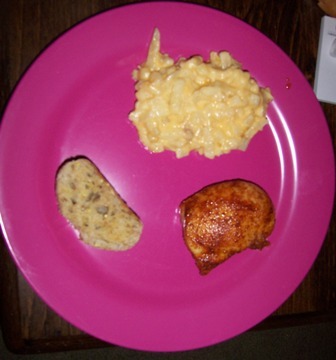 I grilled boneless, skinless chicken breast for this recipe. 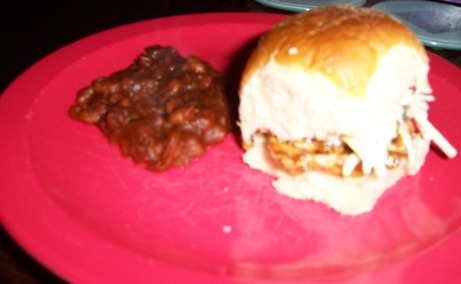 I added barbecue sauce in microwave for a few seconds to warm the sauce. I think this recipe might be better if you used a rotisserie chicken. I served this with Jack Stack’s Bake Beans.